I've been infatuated for months with the idea of creating three dimensional atomic-world art. My first step in that direction has been photographing table-top scenes assembled from found objects. But what I really long to do is create works that are meant to be viewed directly rather than through a photograph or video. My first still-born attempt in that direction was a diorama flipping the archetypal King Kong tower scene by switching the gorilla and girl roles. After a little preparatory work, I realized that my 1/4 scale vision was too big for both my work space and my lackluster power tool chops. I had a number of other ideas that I took a bit farther. But I could never figure out a practical way to create something that I could pick up, move and display. Two fortunate events came together last week that set me on what I hope is a path to a new free-standing work. The first was an introduction to the work of Joseph Cornell who created amazing pieces made from small cabinets, found objects and collage. 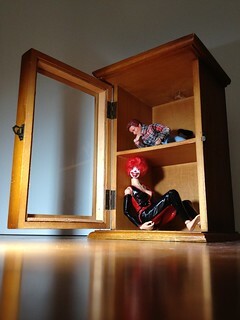 The second was finding a small kitschy cabinet that could be an ideal base for my first project. So far, I've removed the chicken insert, started playing around within the space of the cabinet and have done a little pre-visualization work with some collage ideas. This is going to be a much slower roll than I'm used to. I'll post more in-progress shots as it moves forward. Excellent. I'm looking forward to seeing work in progress pics. My mom uses upended drawers as "boxes" for dioramas and found object collage. I need to send you a couple of pics of examples. Great idea, Botgirl, I look forward to seeing it all progress too...it is slow, yes,......I can suggest some LED lighting ideas if you want to go that far. Soror: I'd love some ideas.